India turned 18 on Wednesday, my first baby is now an adult! A few days before her birthday we discussed making her a birthday dress. I had bought some lovely curtains in a charity shop that I knew would make a beautiful dress for her, but she was unsure. 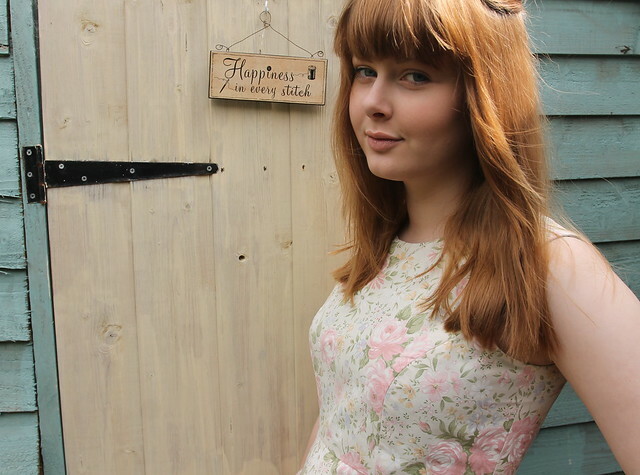 She had been talking about baby doll style dresses, and having seen this dress on Pinterest I suggested I make one like it with some cheap and cheerful printed fabric I had in my stash. She liked that idea so I set about designing something similar. So, with one day until her birthday, I struck a deal with her, that she entertain her littlest brother for the day and I would make her the first dress I suggested. I used the Full Skirt Dress pattern from the Great British Sewing Bee book, but I changed the neckline slightly as requested by India. She didn't like the way the neckline looked quite square on the model in the book. I had to make some changes to the bodice to fit India, letting out the front princess seams slightly to accomodate her bust and taking a little off the shoulders. We left off the cap sleeves, India didn't like them, so made the dress sleeveless. 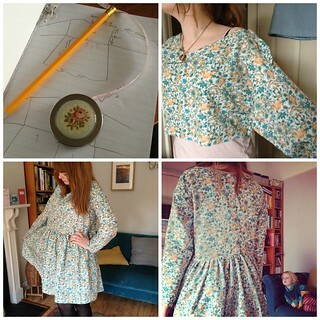 With only a day to make this dress, I realised I had no suitable lining fabric for the bodice. I found a pale green pillowcase I'd recently bought in a charity shop and that worked perfectly as the lining. 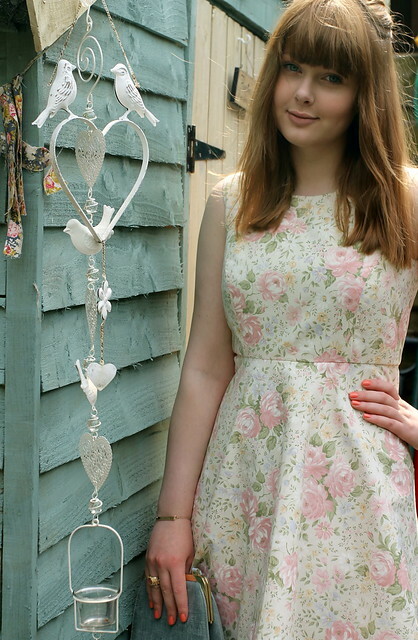 India liked the way the zip finished at the centre back, so I didn't add a hook and eye. 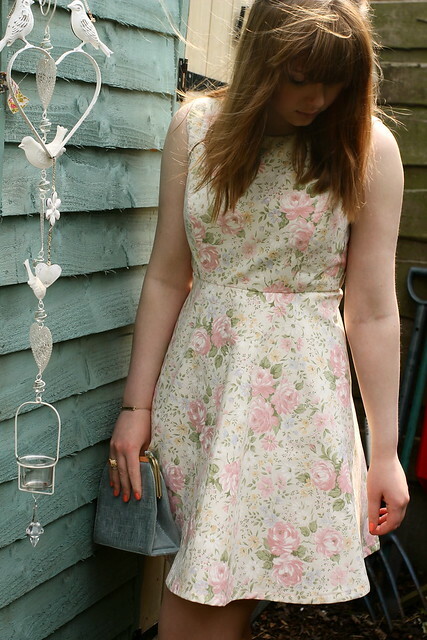 This one she likes, she even said she prefers it to her prom dress! Beautiful Model And Dress! So Pleased She Likes It! Thanks Liz, I'm relieved she likes it too after the disaster of the first dress. Hmm, now what is the phrase "Mum knows best!" Will the discarded dress be rehashed into something else? She has decided the first dress needs shortersleeves and then she might wear it as a casual comfy dress. That is beautiful! 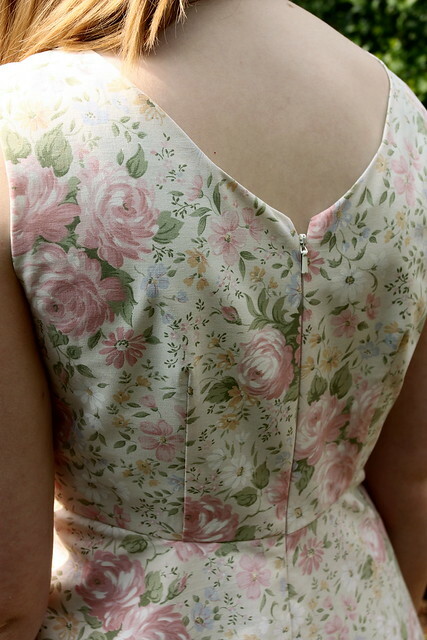 I had a bridesmaid's dress in a similar fabric. Thank you Heather, I did think it would make a lovely bridesmaid dress. Thank you. Yes she is, of course I would think so! So pretty! Great job on persevering and making a second dress. It can be hard to sew for teenagers. I have a daughter who is going to be 18 in December, she's my oldest too, and a redhead! She is so lovely, and as always your skills floor me. Five years on it's so much easier for me to see the blessings we have, and clearly India is one of the most precious. Thinking of you as always! wow, she is simply stunning, I could stare at that first picture of her all day.